Continuing with the Sewing Top Five of 2018 series, here’s the post I always find the most interesting to compile and to read other people’s version of: the misses. This year I had a very hard time coming up with a list of five misses which I guess is a positive! None of these are complete failures. Rather they are things I haven’t worn very much or am not totally satisfied with. The first is my Vogue 1548 dress. I said at the time I loved it and I still do, but I have only worn it three or four times. It’s a dress I can only wear to work, not on a weekend, and it has a strange problem for work wear: the lining is so ultra slippery that it affects my posture when sitting and that eventually becomes uncomfortable and annoying. Such a shame. Replacing the lining would be a pain but I may have to in order to make it wearable. 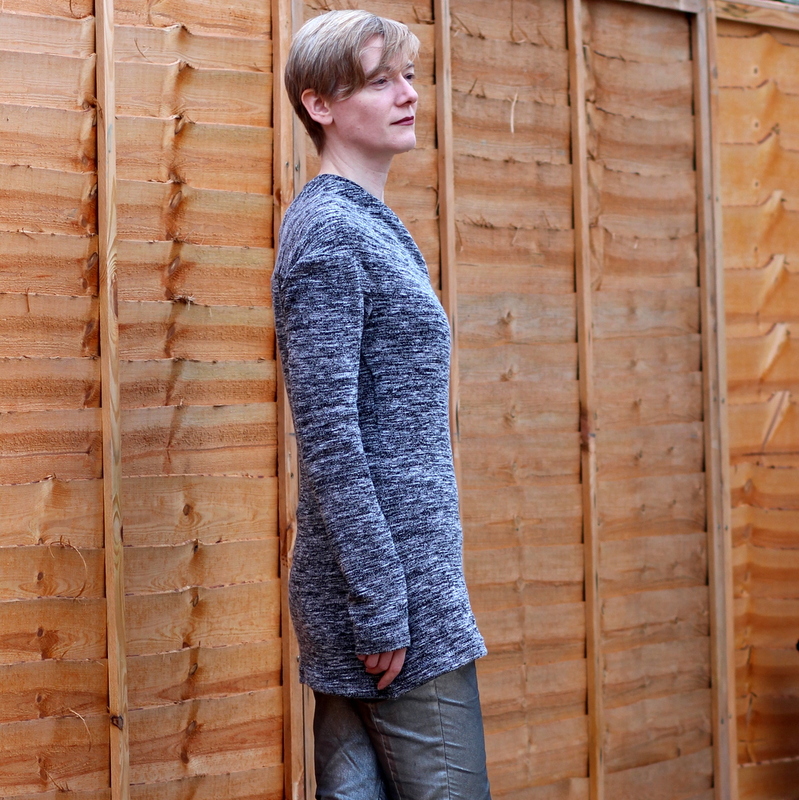 Next up is something I’ve worn a lot despite the bad fit: Vogue 1573 jeans. The pattern is hugely oversized even by Big Four standards. Like most people I almost always need to go down one size from the chart; on these I should have gone down two sizes in most places and maybe three on the waist. The waistband is cut in a way which means important bits end up on the bias, which doesn’t help. At the time I said that I’d like to try grafting the seam detail on these onto a pattern that fits me. But since then I’ve gone off that idea as well; the seamlines aren’t in a flattering place on me. The reason I still wear these is that they’re only pair of black jeans I own. The next one is arguably not a failure at all because it’s easily my most worn make of 2018: my ikat kimono dressing gown. But I made it very slightly too small in order to be able to match the pattern on the rather expensive and narrow fabric I chose. That was a false economy: I’d spent ages looking for the perfect fabric in the first place and I wear the end result most days, if only while cleaning my teeth. It would have been worth buying the extra length and making it generously sized. This next one is a miss for a combination of things: a fabric that’s not quite right, a pattern that doesn’t really suit me, and sewing mistakes. It’s Style Arc’s Mara shirt dress made up in cotton poplin that is a little too light in weight for the style. I messed up sewing the sleeve vents which annoys me every time I wear this. But fundamentally I think this style doesn’t really suit me. It might be better without the belt and the breast pockets, and with a different length hem. This one will probably go to the charity shop next time I have a clearout. The final one really ought to have been a success. I’ve made Burda 116 08/2011 several times before in this exact cotton poplin fabric from Tissu, and they were all great favourites. The originals wore out some years ago and I didn’t replace them because they are impossible to cycle in and at the time I was commuting to work by bike. Several years passed and I switched to getting the bus, so this year I returned to the pattern and made another. But the new one just doesn’t look as good as the originals. Maybe it’s the shade of pink, maybe it’s that I’ve changed shape and can no longer get away with such lightweight fabric, maybe it’s the styling. Anyway I wore it in the summer heatwave but I suspect it’ll be purged before next summer. I don’t think these five have a lot in common, although I do note that every single thing I made this year was a neutral colour (silver is totally a neutral) except for the pink and blue dresses above, and they are the two biggest disappointments. Since I stopped dying my hair fewer colours seem to suit me. Those are the only two I will likely get rid of, so that means that the rest of the year’s output has done pretty well. Next time: highlights and reflections. 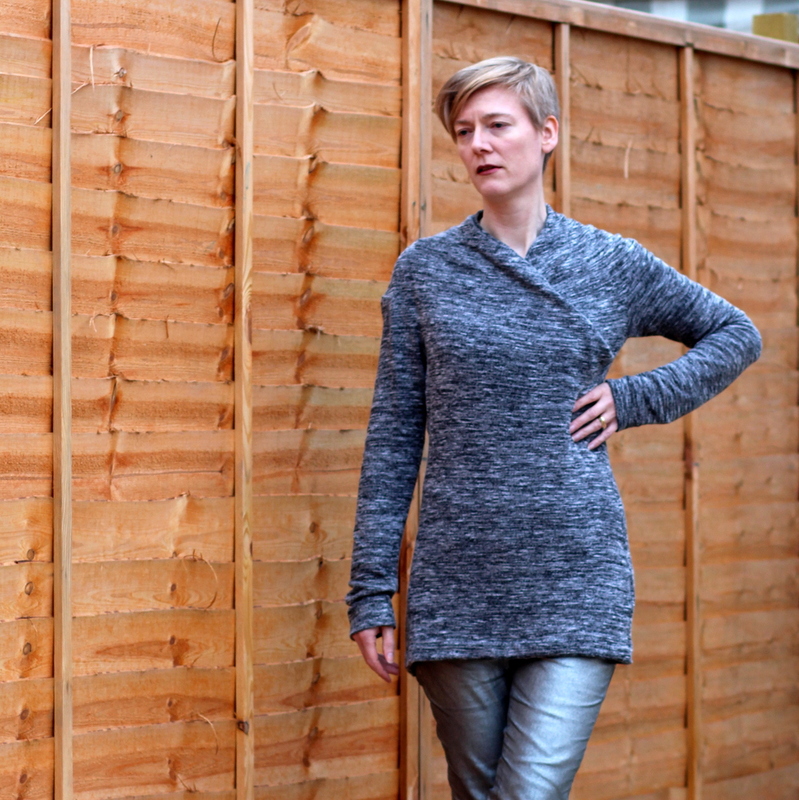 I’m away from my sewing machine at the moment so Gillian’s Top Fives of 2018 blog series has come along at a particularly good time. It’s been a good year for sewing though: I’ve made fourteen things but had a hard time narrowing the hits down to just five. I’ve decided to choose the things I’ve worn the most rather than the most technically challenging or dramatic projects. And because they’ve all had a lot of wear I now have more to say about what works about these projects and what doesn’t. First is Style Arc’s Juliet shirt made up in white cotton poplin. I made it in the summer but it’s kept going for autumn and winter, worn over a long sleeved white t-shirt. I like the extra-long length and the asymmetric tie. Next time I’d make the sleeves full length as the three-quarter length is slightly annoying. Then there are my silver jeans The pattern was originally Burda 103B 07/2010 but it’s been modified quite a bit from the original. 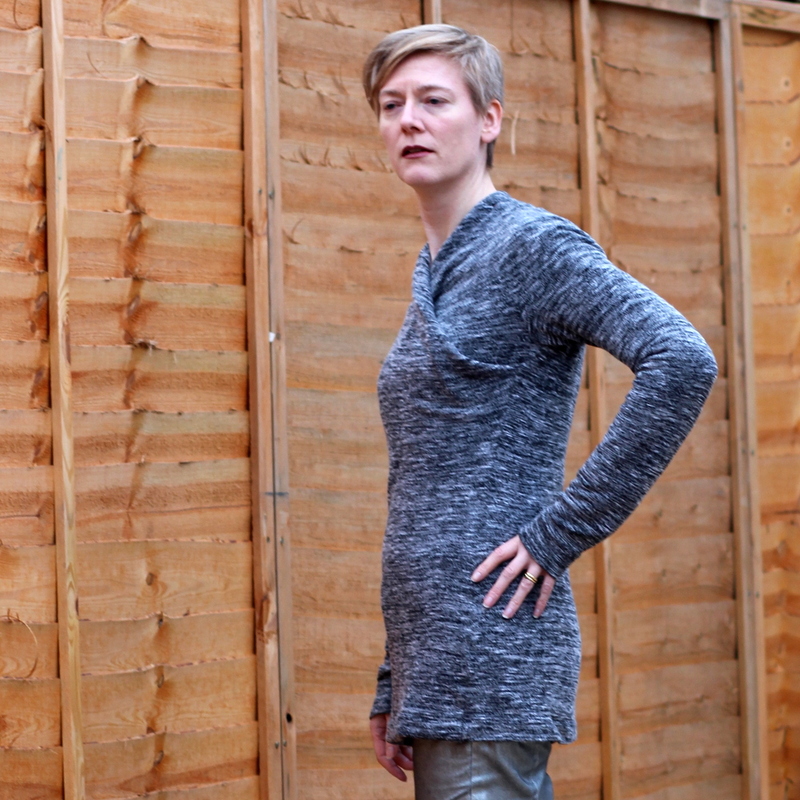 Any slim legged jeans pattern would do; the silver foiled fabric is what really makes these. Unsurprisingly it’s fading; they’re more of a dull silver now than the mirror like finish shown in this photo, but they still get worn about once a week. I find they work best with a very casual top and boots. McCalls 7727 shirt dress doesn’t seem like a practical pattern with its dramatic high-low hem but I have worn this a lot more than I expected to, and I really love wearing it. It’s made from the same cotton poplin as the Style Arc Mara shirt. The length is slightly too much in real life: it drags on stairs, and it catches on my shoes. I’d also do French seams on the sleeves next time because the overlocked seam finishes show when I roll the sleeves up. But a dress which caused someone to mutter ‘Princess Leia’ as I swished by in it has got to be good. Vogue 8956 was my first project of 2018. The day we took the pictures was very sunny and the fabric is black wool flannel which soaks up light so it was hard to get shots where any detail is visible; this one is about the best. The skirt is very warm and practical, and the wrap front stays put surprisingly well. I think this is a really good pattern. It’s easy to sew and the end result is no fuss to wear despite looking very dramatic. My favourite project was unplanned: a friend of my mother’s gave me the white cotton sateen fabric from her stash and there was just enough for Style Arc’s Toni dress, a pattern I’d already made up twice. It’s intended for drapey fabrics but it works really well in this heavy cotton with very crisp interfacing in the collar. I wore it a lot in the summer. 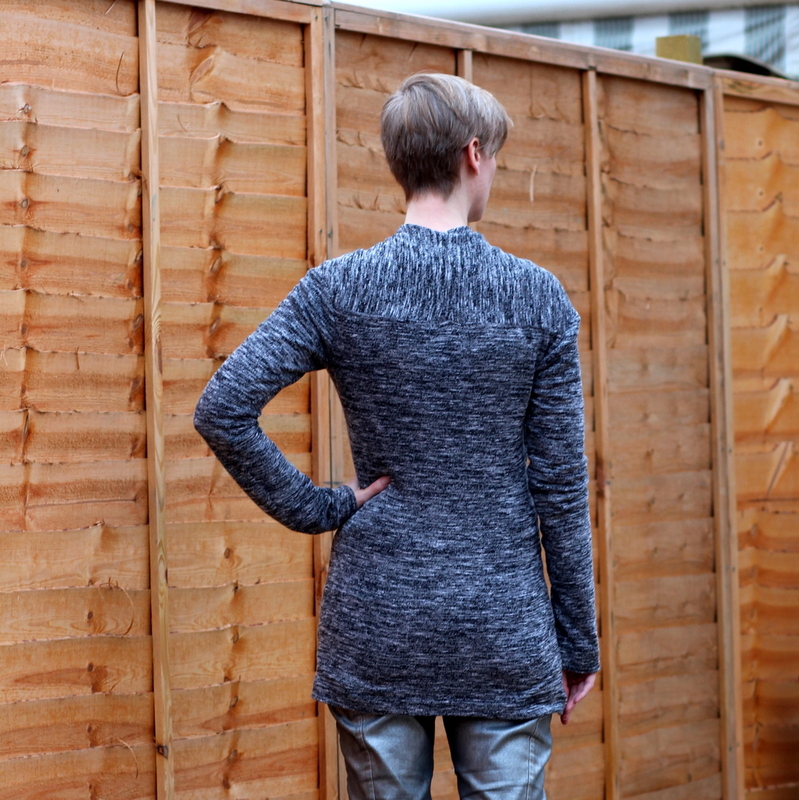 Despite the sculptural shape it’s actually very comfortable and being cotton it washes well. When I first made it I was concerned that the drapes didn’t stay put when I moved but I no longer notice that. So that’s it for the successes…next time the failures!